This new publication by Schulze-Makuch and Irwin serves as a second edition to their 2004 book, and certainly does a good job in updating the material to the very cutting-edge of on-going research. Advances since the previous edition have included the detection of a horde of new exoplanets, results beamed back from the Mars Exploration Rovers, Huygens’ views of the hydrocarbon-soaked landscape of Titan, and the discovery of water geysers spewing out of the south pole of Enceladus. All of these developments are included in this update. Like the first edition, the major strength of Schulze-Makuch and Irwin’s contribution to the expanding bookcase of recent astrobiology texts is in its thorough treatment of many of the expectations of extraterrestrial life that are simply assumed by other publications. Life in the Universe examines exactly why alien life is expected to be most probably carbon-based with water as the biosolvent, but also discusses other proposed alternatives in non-terrestrial-like environments, such as silicon-based biopolymers or different biosolvents such as ammonia. Another unique section in this book is the discussion of plausible energy generation mechanisms available for extraterrestrial life, including metabolism driven by magnetic fields or thermal gradients. 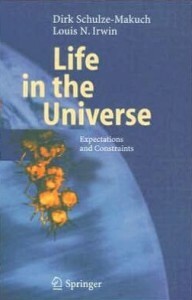 Another good feature of this book, updated from the first edition with subsequent discoveries, is Schulze-Makuch and Irwin’s table of Plausibility of Life ratings, which categorises the planets and moons of the solar system (as well as a few exoplanets) into a 5-bin scale, incorporating many of the crucial parameters effecting potential habitability. A further outstanding section details the arguments back and forth on the veracity of claimed biosignatures in the Viking experiments and martian meteorite ALH84001. A potential weakness of Life in the Universe as a one-stop-shop reference, however, is that it pays only passing attention to many topics that are normally included in the cannon of current astrobiology, including planetary formation theory, suitability of different stellar classes, and exoplanet detection techniques. Furthermore, statements in the text are sometimes backed-up with less-than-useful citations. For example, when explaining that the 300 extrasolar planets discovered to date are almost all giant planets orbiting closely to their star, the follow-up citation given is a review a decade old. Overall though, the second edition of Life in the Universe is an essential reference book for any astrobiologist’s bookshelf, and unique in several important respects. For the sections on biochemical alternatives and energy-generation alone, virtually ignored in other books, I would heartily recommend Life in the Universe and have already referred back to it a number of times myself.